As mentioned in our first Friday Recap, we use Fridays to do reviews of the week or local announcements... and we even alluded to something pretty exciting happening in 2014 last week. Well, this one is for all the local wedding vendors out there! And it's about that thing called social media. Most know I'm pretty passionate about it. I love how it can bridge, connect, and inform-- both in the personal and professional fields. Being a former teacher, I'm also driven by education and helping make information accessible. Over the past few years of building my photography business' online presence, it's been a whirlwind of very wonderful things as social media evolves. Twitter is the reason why I'm going to Hawaii in February 2014 to orchestrate and photograph a stylized wedding shoot. At least a few times a year I get inquiries from brides finding me on Pinterest. And the list continues about the neat little nuggets that pop up. I'm an organic, "let it happen" kinda businessperson, and being an introvert, social media helps me do that in a genuine way ("whatcha see is whatcha get... and then some!"). And quite often, I get emails from fellow photogs or other industry pros asking about certain social media platforms, and it gets me excited to be able to encourage and empower other business owners in the online world with what I've learned and experienced. The great thing is that there is not a one-size-fits-all strategy when it comes to social media. And thank goodness! Or we'd be seeing the same stuff all of the time in our newsfeeds. So, with that said, there are some very key basics that give you a solid foundation to building your unique social media presence. 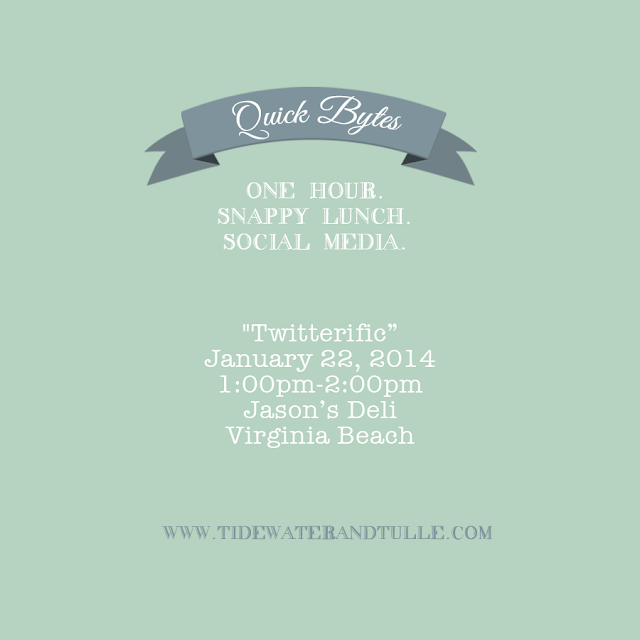 Quick Bytes is a monthly in-person working lunch series to help educate about the power of social media and how it relates to the wedding industry, locally and at large. Each month, we will go to different restaurants on the Southside and Peninsula and even have some "special speakers." Dates, locations, and topics will vary. For more information on our January get-together, please head over to our Facebook Event to RSVP. Seats are limited to keep these Quick Bytes personal and approachable so please be sure to register for a ticket! Not able to make it to Twitterific? Take a look at the schedule below to see upcoming cities and topics! Dates to be announced. Pending local interest, we may rotate topics, add on dates, or change things up. So please be vocal about what you want to learn and feel free to contact us with questions.